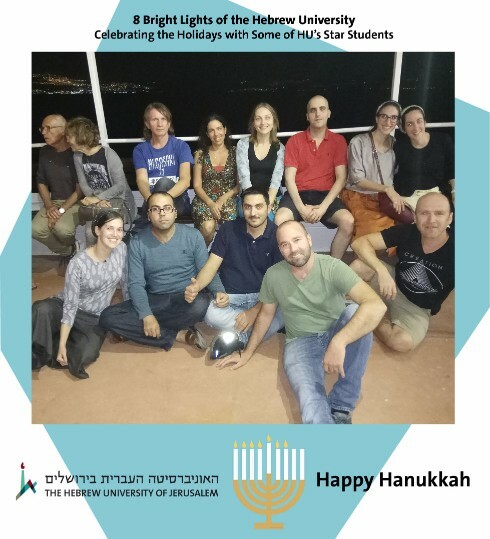 This year, we are celebrating the 8 days of Hanukkah with 8 of the Hebrew University’s bright students. On each day we will be posting a picture along with a q&a. Ahmad is 31 years old and is from Gaza, and currently lives in Bethlehem. He completed his bachelors’ degree in Gaza, and a master’s degree in Europe. Ahmad is the first student from Gaza to study at the Hebrew University in the past ten years. My favorite holiday is Eid al-Fitr, which is the celebration following Ramadan. After fasting we celebrate with our friends, family and neighbors. We enjoy great food and celebrate together as a community. What was a miracle that happened to you this year? The fact that I was able to join the program, has been a miracle, especially considering that I’m the first from Gaza in at least ten years.